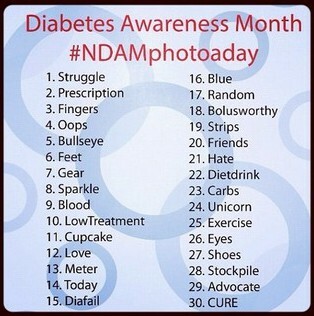 Yep, it's November and that means is Diabetes Awareness Month! I knew I wanted to do 'something-a-day' but didn't know what that would be until I went scrolling through Facebook this evening and came across the photo-a-day list. So, it will be a month of photos (and probably some words, too!) 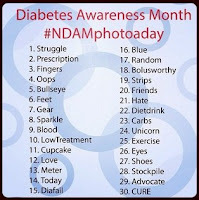 to help you catch a glimpse into our world with T1D. This is Bean's lowest low BG to date. I happened just a few days ago. The reason this comes to mind when I think of 'struggle' is because it was an hours long ordeal to bring that number up and keep it up. 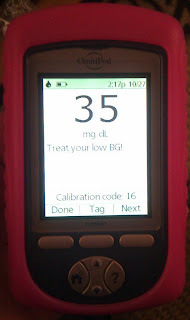 She had a big juice box...the 24g carb one, not the 15g carb one...which brought her up to 51; then an applesauce that brought her up to 72; then she ate dinner, without any insulin coverage, and that brought her up to 113. She dipped back into the 80s, and it was well into the night before I considered this low 'treated' and over. Wow. I've seen my fair share of thirty-somethings since Ella doesn't sense her lows until she's ridiculously low and we have yet to have one that didn't come up within 15 minutes. Not looking forward to experiencing it. Glad Bean is OK. XOXO. I think I'm going to "steal" this idea for the month on my blog - hope you don't mind. Thanks!! !